If you want your :wave to synchronise timecode data with other Timecode Systems products, such as SyncBac PRO, :wave, or other :wave units, you need to set up a BLINK network. This is a group of Timecode Systems devices that all use the same RF channel to communicate with each other, and one of the devices, typically a :pulse or :wave, has to be set to run in a master mode. All of the other devices have to be set to run as slaves. The timecode that will be used is set in the master, and it will send the timecode to the slaves automatically when they are in range. Set Up :wave as a Slave. With the Int-Gen TX mode, the :wave&apos;s timecode, user bits, and frames-per-second values are used and sent to the slave devices. With the Ext-TC TX and Ext-TC/C TX modes, the timecode, user bits, and frames-per-second values are set in a camera, sound mixer, or other device that is connected to the :wave via the TC port - the :wave receives these values, applies them in its own settings automatically, and then sends them to the slaves. System Settings Set the RF Country/Area to the country in which you are using the :wave. Set the RF Country/Area. TC Generator Set the timecode, user bits (metadata) and frames-per-second values. These are used by the :wave and are also sent to the slave devices in the BLINK network. Set the Timecode Data. These settings are only used if the :wave is connected to a camera, sound mixer or other device via the TC/SYNC BNC port. They are used for setting the :wave to send timecode, genlock, or word clock data via BNC. For the BNC O/P Level, choose Normal. If the :wave fails to send genlock, word clock, or LTC via the TC/SYNC port, change the BNC O/P Level to High. Wi-Fi Turn on if you want the :wave to communicate with the BLINK Hub app wirelessly. If you are not going to use BLINK Hub or you are going to use an Ethernet connection instead, turn Wi-Fi off to preserve battery power. Set up Wi-Fi for Data Streaming. With these settings in place, your :wave will connect to the slave devices that are in the same BLINK network and are in range. It will provide them with the timecode data so that they are synchronised. System Settings Set the RF Country/Area to the country in which you are using the :wave. If you purchased your :wave in North America, you cannot change the country area due to regulatory requirements - if you need to change the country, please contact Timecode Systems for assistance. Set the RF Country/Area. With these settings in place, your :wave will connect with the master device in the BLINK network as long as your :wave is in range. It will receive the timecode data from the master and continue to communicate with the master to ensure that they remain synchronised. Your :wave independently, where it is jammed to the timecode signal provided by an external device. Your :wave as part of a BLINK network, where it can synchronise with other Timecode Systems devices as well as your video camera. Quick Set Up BLINK Network :wave to Video Camera. For a general introduction to the concept of using your :wave to provide a camera with timecode and genlock, see Synchronising with a Camera. Note: For details on how to set up your video camera for remote control via the BLINK Hub app, see Quick Setup: BLINK Hub and :wave. Note: This section does not apply to GoPro HERO4™ Black or Silver cameras. These cameras can be physically connected to Timecode Systems&apos; SyncBac PROs, and then :wave can communicate with the SyncBac PRO and the cameras via the BLINK network (see Master and Slave Relationships in a BLINK Network). Use the control knob to access the Timecode Mode menu. Free Run/Jam-Ext to set your :wave to run independently of a BLINK network. You should choose this setup if you want your :wave to synchronise with your video camera, but not with any other Timecode Systems devices. Turn on if you want your :wave to communicate with the BLINK Hub app wirelessly. If you are not going to use BLINK Hub , turn Wi-Fi off to preserve battery power. Connect your external timecode source to the TC LEMO 5 port on your :pulse. When connected, use the control knob to access the TC Generator option and jam your :pulse to the external timecode. Select Jam EXT T/C to synchronise your pulse with the external timecode source. When the jamming is successful, you can disconnect the external timecode source. You will need to re-connect the external timecode source and re-jam at regular intervals (typically 1-2 times per day). When your :pulse has jammed successfully, disconnect it from the external timecode source. Connect your video camera to the timecode output on your :pulse. There are two ways of outputting timecode to a video camera. via the TC port with a TCB-20 (5-pin to 5-pin LEMO) cable. via the TC/SYNC port with a TCB-10 (BNC to BNC) cable. Note: You will need to re-connect the external timecode source and re-jam at regular intervals (typically 1-2 times per day). Int-Gen TX to set your :wave as the master in the BLINK network. The timecode will be generated from your :wave (TC Generator settings). Your :wave can output this timecode to your video camera. Ext-TC/C TX to set your :wave as the master in the BLINK network and the timecode will come from an external source. If the timecode source is disconnected, the :wave&apos;s internal timecode is used instead. The :wave forwards the timecode to the slaves.It also sends the timecode out to any devices that are connected to its output ports. Ext RF Slave to set your :wave to run as a slave. It will receive timecode from the master device in the BLINK network, and this timecode will be passed on to the video camera (via the :wave&apos;s output ports). If you are not going to use BLINK Hub, turn Wi-Fi off to preserve battery power. RF Channel The RF Channel number that is used by the other Timecode Systems devices in the same BLINK network. Set the RF Channel. Set the RF Country/Area to the country in which you are using the :wave. If you purchased your :wave in North America, you cannot manually change the country area due to regulatory requirements. However, there is a way to change the country - please contact Timecode Systems for assistance. This step only applies if your :wave is set to run in the Int Gen-TX mode. If your :wave is set to a different mode, ignore this step. TC Generator Set the timecode (Set T/C) and metadata (Set U/B). This data is &apos;stamped&apos; into the video files that are created by your video camera. They are also sent to any slave devices in the BLINK network. Set the Timecode Data. TC Generator Define the frames-per-second rate data by using the Set FPS option. The FPS has to match the FPS used by the video camera for the shoot. This data is used for synchronising each frame of filming with the timecode. Set the Frame Rate Per Second. This step only applies if your video camera has a genlock input (refer to the manufacturer&apos;s instructions for more details). Use a TCB-10 (BNC to BNC) cable to connect your video camera&apos;s genlock input port to the :wave&apos;s TC/SYNC port. This step only applies if your video camera has a genlock input. Set the BNC O/P Mode to the appropriate genlock signal for your video camera. The manufacturer&apos;s instructions for the video recorder should include information on the type of genlock signal that is required. Set BNC O/P Level Your video camera&apos;s instructions may specify a required signal level. If so, set the BNC O/P Level to Normal or High as appropriate. If the instructions do not specify a level, set the BNC O/P Level to Normal. Set the Genlock Output. Set your video camera to receive an external genlock signal. Please refer to the manufacturer&apos;s instructions for more details. Connect your video camera to the timecode output on your :wave. There are two ways of outputting timecode to a sound mixer/recorder. This step only applies if you want your :wave to output timecode via the TC/SYNC port (see previous steps). Access the Sync Generator menu and set the Set BNC O/P Mode to LTC. This sets your :wave to output timecode via the TC/SYNC port. Set your video camera to receive timecode data via the appropriate port. Please refer to the manufacturer&apos;s instructions for more details. What if a Slave Can&apos;t Find a Master? What if there are Multiple Masters in the Same BLINK Network?. If you are familiar with BLINK networks and just want to set up your :wave, see Quick Set Up :wave in a BLINK Network. A BLINK network is a group of devices that are all set to use the same RF channel. Timecode Systems devices synchronise with each other by using radio (RF) to send and receive timecode. Each device has to be set to use a specific RF channel and can only synchronise with other devices also using that RF channel. For example, if you set your :wave to use RF channel 9, it can communicate and synchronise with other devices that also use RF channel 9. But it can&apos;t synchronise with devices that use different RF channels, such as RF channel 3 or RF channel 5. Each BLINK network should have one device set to run as a master, with all of the other devices running as slaves. The master device will send its timecode to the slave devices, so that all of the devices in the network use the same timecode. Let&apos;s say you are filming an action scene and you are using two video cameras, a sound mixer, and four SyncBac PROs with GoPro HERO4™s attached. You connect a :wave to each camera and to the sound mixer. 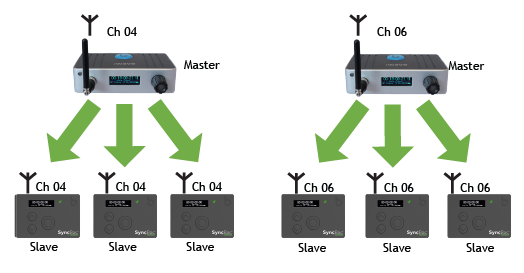 To synchronise, the devices all need to use the same RF channel and one device has to be set to run as a master with the others set to run as slaves. The master sends its timecode to all of the slaves (see :wave and the BLINK Network). 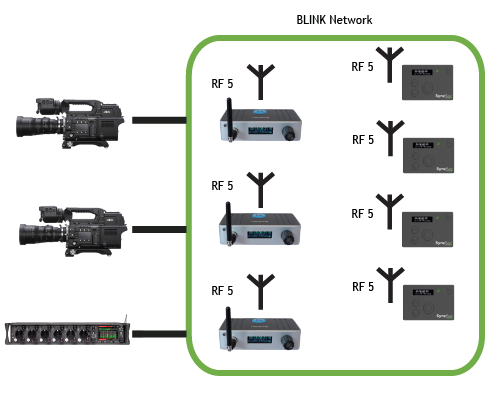 In the image shown, all of the devices in the BLINK network are set to use RF channel 5. 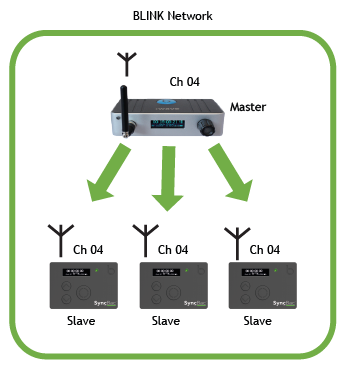 To synchronise, the devices in a BLINK network use a master and slave relationship. This allows the master&apos;s timecode data to be applied to all of the devices. One device is set to run in master mode and all of the other devices are set to run as slaves. When a slave is switched on, it announces itself on the network, and the master will detect it (as long as the slave is in range of the master). The master device then sends its timecode data to the slave device, and the slave device applies the timecode automatically. This process is repeated for each slave in the BLINK network, so that all of the slaves and the master are synchronised using the same timecode. To make sure the timecode data continues to be synchronised, the master and slaves communicate regularly. Note: You don&apos;t have to use your :wave as part of a BLINK network. You can use it as a stand-alone device if required, by putting it into Free Run/Jam-EXT mode (see Free Running and Jamming). The slave device is within range of the master device. There is a master device in the BLINK network (there should be one master device per BLINK network, but it is possible that the master is off or has been set up incorrectly). There is no interference or blockage of the RF signal between the master and slave. Runs using its own internal clock. If it was previously synchronised with a master, the slave&apos;s internal clock will still be closely matched to the master&apos;s clock (as they were synchronised). Continues to search for a master. If it was previously synchronised with a master, it will only search for that specific master. The slave will not connect to any other masters that come into range. When the slave detects a master, it connects and synchronises. If the slave was previously connected to the master but lost its connection, the resynchronisation will be smooth, with no sudden jumps in the timecode. A camera crew are going to film an exciting river rafting scene in Europe. They fit GoPro HERO4™ Silver cameras to the boats, and the HERO4™s are connected to SyncBac PROs. The SyncBac PROs are set to run as slaves. The FPS is set to 25:00, which is appropriate for the HERO4™ cameras being used on the shoot. Before filming begins, the SyncBac PROs and :wave are synchronised at the technical centre (where the SyncBac PROs are in range of the :wave). The SyncBac PROs and HERO4™ Silvers are then fitted to the boats. As soon as the SyncBac PROs are out of range, they start to use their own internal clocks and are no longer synchronised with the :wave. However, as they have extremely accurate clocks and were synchronised with the :wave at the start, they remain very accurate. Filming begins and the GoPro HERO4™ Silver cameras record the action as the boats head down the river towards the technical centre. As the boats come into range of the :wave, the :wave connects with the SyncBac PROs and they re-synchronise. Because the SyncBac PROs are so accurate, the resynchronisation is a &apos;soft sync&apos; - the SyncBac PROs gradually synchronise with the master :wave frame-by-frame. There is no sudden jump in the timecode. What if there are Multiple Masters in the Same BLINK Network? You should set up your Timecode Systems devices so that there is one master device per BLINK network. This ensures that all of the slave devices synchronise with the same timecode source (the master device&apos;s timecode). When you switch on a slave device, it announces itself on the network so that it can connect to a master. It will connect to the first master that responds. That&apos;s why it is important that there is only one master in the network - if there are multiple masters, there is no guarantee that all of the slaves in the network will connect to the same master, and so this can lead to differences in the timecode being used. When a slave connects to a master, it stores the name of the master device. If it then loses its connection with the master, it will free run using its own internal clock and will keep searching for the master. If another master comes into range, the slave will ignore it - it will only connect to the master device that matches the name stored in the slave. However, if you turn the slave off and then back on again, the slave will connect to the first master that responds. Let&apos;s say you have a BLINK network where all of the devices are set to use RF Channel 4. There is one master, which is a :wave, which we will call :wave A for this example. There are also three SyncBac PROs which are set to run as slaves. The :wave and SyncBac PROs are all turned off and you add a second :wave (:wave B) to the BLINK network. You set :wave B to run in Int-Gen TX mode (a master mode), which means that when the devices are all turned back on, there are two masters in the BLINK network - :wave A and :wave B. The SyncBac PRO slaves announce themselves on the network so that they can connect to a master. As they have been switched off, they will connect to any master - they are not expecting a master with a specific name. Two of the SyncBac PROs detect the :wave A master first, and synchronise with it. But the other SyncBac PRO finds :wave B first, and so synchronises with that instead. As a result, the devices in the BLINK network are not all using the same timecode. To fix the problem, you turn all of the SyncBac PROs off and set :wave A to run as a master and :wave B to run as a slave. You then turn the SyncBac PROs back on and they all synchronise with :wave A (as it is the only master). When they synchronise, the SyncBac PRO slaves store the name of the master :wave (:wave A). During the shoot, the SyncBac PROs are moved out of range of the :wave A master, and so they lose their connection and switch to free running. The SyncBac PROs then come into range of another master device, but they ignore it - they will only connect to :wave A. The slaves continue to free run, until they come back into range of :wave A or are switched off and then back on again (at which point, they forget their connection to :wave A and will connect to the first master device that responds). Some sound recorders and mixers, such as the Sound Devices 6-series range, can receive timecode and word clock signals from an external source. You can use your :wave as the external source - it will provide timecode and word clock signals. The timecode signal provides the &apos;time stamp&apos; information that is added to the recording, such as the time and any user-defined metadata. The word clock signal allows the sound mixer to synchronise the timing of its audio recording with the timecode. This significantly reduces the amount of work required in post-production. 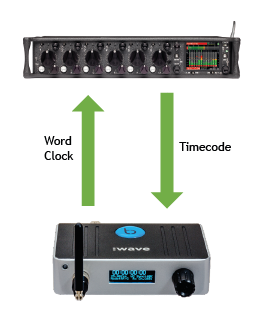 If your sound mixer does not support external word clock, :wave can still provide it with highly accurate timecode. In this situation, there is no word clock signal to synchronise the timecode with the timing of the audio recording, so while the time stamps in the recording will be slightly less accurate. In one day of recording, there should be no, or very little, clock drift. Over a longer period, the clock drift may increase. For this reason, we recommend that you re-sync your :wave and sound mixer at the start of each day (as a minimum requirement). Set the timecode mode for the :wave. This defines its relationship with any other Timecode Systems devices and also sets the :wave to either send or receive timecode data via its TC port. Set the sound mixer/recorder to accept external word clock and timecode signals. Set the :wave to output the type of word clock signal that is supported by the sound mixer/recorder. The most common arrangement is to set your :wave to send/receive timecode via the TC port and send word clock via the TC/SYNC port. It is possible for your :wave to output timecode via the TC/SYNC port, but it cannot be used to output word clock at the same time. A :wave is connected to a Sound Devices 6-series mixer/recorder via the TC and TC/SYNC ports. It is set to run as an RF slave. Another :wave is set to run as a master and there are also two SyncBac PROs which are set to run as slaves. 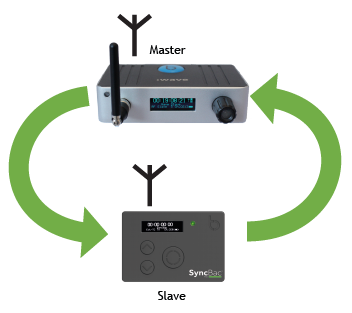 The master :wave sends the timecode to the slave :wave and the SyncBac PROs via radio (RF). The SyncBac PROs feed the timecode to the GoPro HERO4™ Black cameras to which they are attached. The slave :wave feeds the timecode and a word clock signal to the sound mixer/recorder (timecode via the TC port, word clock via the TC/SYNC port). As a result, the slave :wave, sound mixer/recorder, SyncBac PROs and GoPro HERO4™ Black cameras are all synchronised with the master :wave. For setup details, see Quick Set Up :wave Connected to Sound Mixer/Recorder. Your :wave as part of a BLINK network, where it can synchronise with other Timecode Systems devices as well as your sound mixer/recorder. Quick Set Up BLINK Network :wave to Sound Mixer/Recorder. 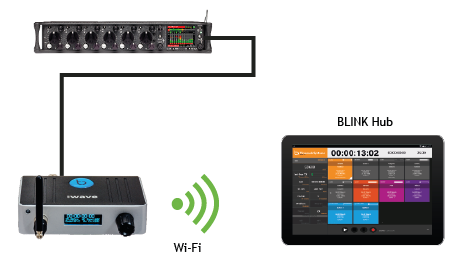 Note: For details on how to set up your Sound Devices 6-series sound mixer/recorder for remote control via the BLINK Hub app, see Quick Setup: BLINK Hub and :wave. Free Run/Jam-Ext to set your :wave to run independently of a BLINK network. You should choose this setup if you want your :wave to synchronise with an external device or system and then pass the timecode on to your sound mixer/recorder. Your :wave will not communicate with any other Timecode Systems devices. Connect your external timecode source to the TC LEMO 5 port on your :wave. When connected, use the control knob to access the TC Generator option and jam your :wave to the external timecode. Select Jam EXT T/C to synchronise your :wave with the external timecode source. When your :wave has jammed successfully, disconnect it from the external timecode source. Connect your sound mixer/recorder to the timecode output on your :wave. There are two ways of outputting timecode to a sound mixer/recorder. Int-Gen TX to set your :wave as the master in the BLINK network. The timecode will be generated from your :wave (TC Generator settings). Your :wave can output this timecode to your sound mixer/recorder. Ext-TC/C TX to set your :wave as the master in the BLINK network and the timecode will come from an external source, such as your sound mixer/recorder. If the timecode source is disconnected, the :wave&apos;s internal timecode is used instead. Ext RF Slave to set your :wave to run as a slave. It will receive timecode from the master device in the BLINK network, and this timecode will be passed on to the sound mixer/recorder. Turn on if you want your :pulse to communicate with the BLINK Hub app wirelessly. If you are not going to use BLINK Hub or you are going to use an Ethernet connection instead, turn Wi-Fi off to preserve battery power. TC Generator Set the timecode (Set T/C) and metadata (Set U/B). This data is &apos;stamped&apos; into the audio files that are recorded by your sound mixer/recorder. They are also sent to any slave devices in the BLINK network. Set the Timecode Data. This step only applies if your sound mixer/recorder has a word clock input (refer to the manufacturer&apos;s instructions for more details). 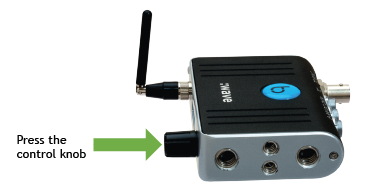 Use a TCB-10 (BNC to BNC) cable to connect your sound mixer/recorder&apos;s word clock input port to the :wave&apos;s TC/SYNC port. This step only applies if your sound mixer/recorder has a word clock input. Set the BNC O/P Mode to the appropriate word clock signal for your sound mixer/recorder. The manufacturer&apos;s instructions for the sound mixer/recorder should include information on the type of word clock signal that is required. Set BNC O/P Level Your sound mixer/recorder&apos;s instructions may specify a required signal level. If so, set the BNC O/P Level to Normal or High as appropriate. If the instructions do not specify a level, set the BNC O/P Level to Normal. Set the Word Clock Output. Set up the sound mixer/recorder to receive word clock data from an external source. Please refer to the manufacturer&apos;s instructions for your sound mixer/recorder. Set your sound mixer/recorder to receive timecode data via the appropriate port. Please refer to the manufacturer&apos;s instructions for your sound mixer/recorder. One of the key features of your :wave is that it can provide timecode and genlock to professional video cameras, such as the Sony® F55®. The timecode data provides the &apos;time stamp&apos; information that is added to the recording, such as the time and any user-defined metadata. 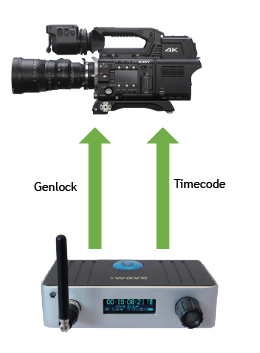 The genlock signal allows the camera to synchronise the frames of its recording with the timecode, so that the video and timecode always match. Using a combination of timecode and genlock eliminates problems caused by the camera&apos;s clock drift and significantly reduces the amount of work required in postproduction. For cameras that do not have genlock, :wave provides highly accurate timecode only. Note: If you are using a camera without genlock and have your :wave in Free Run/Jam Ext mode, you will need to synchronise your camera and :wave at the beginning of each day of filming. This is not required if your :wave is part of a BLINK network and is connected to your camera. When you set up your camera and :wave, you need to connect the camera to the :wave&apos;s TC port for timecode sync and to the TC/SYNC port for receiving genlock. You also need to set the camera to receive external genlock. To set up your :wave, you need to choose the appropriate genlock signal (this should be specified in the manufacturer&apos;s instructions for the camera). You also need to consider whether your :wave is free running or part of a BLINK network. If it is the master in the BLINK network, it will send a genlock signal to the camera. For timecode, it will either send its own timecode to the camera and the slave devices or it will receive timecode from the camera and send it to the slaves. You control this by setting the master mode for the :wave (see Set the Timecode Mode). If your :wave is a slave in the BLINK network, it will receive timecode from the master device and then pass it on to the camera. If your :wave is set to run in Free Run/Jam Ext mode, It has to be synchronised (&apos;jammed&apos;) to a timecode source. This timecode is then sent to the camera as well as a genlock signal (if supported). Note: It is possible for your :wave to output timecode via the TC/SYNC port, but it cannot be used to output genlock at the same time. To learn how to set up your :wave to output genlock and timecode, see Quick Setup :wave Connected to Camera. If you want to use your :wave independently or in a third-party system instead of a BLINK network, you will need to set it to run in Free Run/Jam Ext mode. This is because for synchronisation with Timecode Systems products, :wave uses our proprietary RF protocol and master-slave relationships, and these are not recognised by other systems. In Free Run/Jam-Ext mode, your :wave can run in a more traditional &apos;external jamming&apos; workflow, where synchronisation is achieved by connecting devices and jamming to a timecode signal. Jam your :wave to the External Timecode Source. Note: RF is automatically disabled in Free Run/Jam-Ext mode. To preserve battery life, it also makes sense to disable the other features that won&apos;t be used in an external jamming workflow, such as Wi-Fi. Note: Disabling Wi-Fi support is not essential to free running and jamming, but turning it off will help to preserve battery life. When you have your :wave set to run in Free Run/Jam-Ext mode, your next step is to Jam your :wave to the External Timecode Source. When you have your :wave in Free Run/Jam-Ext mode, you can synchronise it with an external timecode source, such as a camera. To do this, you will need to connect the timecode source to the :wave via the TC port. You can then set the :wave to start jamming to the timecode source. Connect the external timecode source to the TC LEMO 5 socket on your :wave. Your :wave will now attempt to synchronise with the timecode source by jamming to the signal. You will see Jamming T/C appear on the main screen as the attempt to jam to the signal takes place. If your :wave can&apos;t synchronise to the signal, the message Jam Failed No Signal is shown. This usually indicates that the timecode source is not connected properly or is not outputting a timecode. Check the connections and make sure the timecode source device is set up to output its timecode. When the jamming is successful, the :wave is synchronised with the external timecode source. You can now disconnect the external timecode source. But you will need to re-connect the external timecode source and re-jam at regular intervals (typically 1-2 times per day). 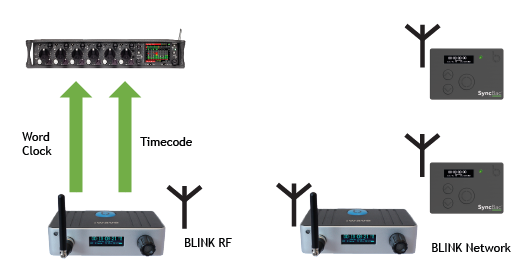 Your :wave uses radio (RF) to communicate with other Timecode Systems devices in a BLINK network. It only uses our proprietary RF protocol for sending and receiving timecode data. The regulations for the use of radio frequencies vary in different countries, so it is important that you set your :wave to use the correct frequencies for the country in which is it being used. Note: The RF Country/Area setting does not apply to :wave units sold in North America and Canada. If you purchased your :wave in the US or Canada and wish to use it in another country, please contact Timecode Systems. We can provide you with a free updater application that will allow you to set the country/area. Note: If you want to use your :wave in another region, please contact Timecode Systems for advice. Your :wave will now communicate using radio frequencies that are appropriate for the region you selected. For time synchronisation, your :wave can be used independently (free running) or as part of a BLINK network, where it can be set as a master or slave. If it is set to be a master, it will send its timecode to the slave devices in the BLINK network, and if it is a slave, it will receive timecode from a master device. You can set your :wave to free run or operate as a master or slave, by using the Timecode Mode setting. :wave runs independently (free running). It is not part of a BLINK network. In Free Run/Jam Ext mode, you need to synchronise (&apos;jam&apos; ) the :wave with timecode from an external source. It can then be used independently and it can output the timecode via its TC or TC/SYNC port. For more details, see Free Running and Jamming. :wave is the master unit and it uses the timecode values that you apply in the :wave&apos;s settings. The timecode will be sent to any slave devices in the same BLINK network, and can also be sent to a device that is connected to the :wave via the TC port. You can set the timecode for the :wave manually, by using its Set T/C setting (see Set the Timecode Data. Ext-TC TX :wave is the master unit and gets its timecode values from an external source, such as a camera (via a LEMO® 5 connector). :wave then sends its timecode to the slaves in the same BLINK network. If the external timecode source is disconnected, the clock in the :wave and the slaves &apos;freeze&apos; at that time. :wave is the master unit and gets its timecode settings from an external source, such as a camera (via a LEMO® 5 connector). :wave then sends the timecode to the slaves in the same BLINK network. If the external timecode source is disconnected, the :wave will use its internal timecode instead. It will send this timecode to the slave devices. :wave acts as a slave unit and receives its timecode from a master device in the BLINK network. It communicates regularly with the master to make sure that its timecode matches the timecode of the master, and it also sends its status data to the master device. If the :wave is connected to a camera or sound mixer, it can output its timecode via its TC port or TC/SYNC port. She then sets the :wave to run in Free Jam/Ext-T mode and enables the Wi-Fi feature, so that the BLINK Hub app can connect to the :wave wirelessly. Next, she jams the :wave to the sound mixer&apos;s timecode by using the TC Generator > Jam EXT T/C setting. The :wave then jams (synchronises) with the sound mixer. When the jamming is complete, the engineer positions the sound mixer and :wave in a suitable position for making the recording and then moves away to a safe position. The :wave needs to be connected to the sound mixer via the DATA port to allow the sound mixer to be controlled remotely. From her new location, which is in range of the :wave, the engineer launches the BLINK Hub app on her tablet. It connects to the :wave via Wi-Fi, and she can then control the sound mixer from BLINK Hub. The following day, the engineer repeats this process, making sure to resynchronise the :wave with the sound mixer (this keeps the timecode synchronised with the sound mixer&apos;s internal clock, which is less accurate than the :wave&apos;s clock and so is more prone to clock drift). An outdoor scene is being filmed, using two cameras, with a sound mixer recording the audio. To synchronise all of the video and audio recordings, :wave units are connected to the cameras and the sound mixer. To achieve this, the sound mixer is connected to a :wave via the TC/SYNC port (for word clock) and TC port for timecode. This :wave is set to run in Int-Gen TX mode so that it is the master. The cameras are connected to :waves via the TC/SYNC ports for genlock and TC port for timecode. They are set to run in RF Slave mode. The sound engineer enters the required timecode for the shoot into the master :wave&apos;s settings. The master :wave then sends its timecode to the slave :waves via RF. It also outputs the timecode to the sound mixer. The slave :waves receive the timecode and apply it locally. They then send the timecode to the cameras via the TC port. They also send genlock signals to the cameras, via the TC/SYNC port. Let&apos;s say you are using multiple cameras and a sound mixer, all connected to :wave units. The sound mixer&apos;s :wave is set to run in Ext-TC TX mode (master) and the camera :wave units are set to run as RF slaves. The sound mixer is connected to its :wave via the TC port for timecode and the TC/SYNC port for word clock. The :wave receives timecode from the sound mixer and passes it on to the slave :waves, so that they can feed it into the cameras. The cameras and sound mixer are all synchronised. During filming, the sound mixer becomes disconnected and so it cannot provide its :wave with timecode. At this point, the :wave &apos;freezes&apos; its internal clock and stops sending timecode data to the slaves. Let&apos;s say you are using multiple cameras and a sound mixer, all connected to :wave units. The sound mixer&apos;s :wave is set to run in Ext-TC/C TX mode (master), and the camera :wave units are set to run as RF slaves. During filming, the sound mixer is disconnected, and it cannot provide its :wave with timecode. At this point, the master :wave switches to its internal timecode instead of the external timecode source, and passes this timecode on to the slaves. The internal clock is already closely matched to the external timecode source, so there is no sudden jump in the recording. Imagine you are going to film a ski event and you are using two video cameras for wide shots and GoPro HERO4™ Black cameras for the skiers&apos; perspectives. To synchronise the recording, you connect a :wave to each video camera, and a SyncBac PRO to each HERO4™ Black. The SyncBac PROs and HERO4™s are worn by the skiers. The :waves and SyncBac PROs are set to use the same RF channel so that they form a BLINK network. There can only be one master device in a BLINK network, so one of the :waves is set to run in Int-Gen TX mode and the other :wave and the SyncBac PROs are set to run as RF Slaves. The RF Slave :wave and SyncBac PROs are synchronised with the master :wave and then moved into position for filming. They will receive their timecode from the master :wave while it is in range and will switch to their own internal clocks when out of range of the master. Note: This section only applies if you have set your :wave to run in Int-Gen TX mode (:wave is master and uses its internal timecode setting). You need to set the timecode for the master :wave unit, so that it has the correct timecode settings for your requirements. These timecode settings will be sent to any slave devices in the same BLINK network, and also to any connected cameras or sound mixers. Note: The timecode data also contains user bits and frames-per-second information, which you can also define in your :wave&apos;s settings. To learn how to do this, see Set the User Bits and Set the Frame Rate Per Second. To make it easier when editing your recordings, you can add metadata to the timecode data. You can define 4 pairs of characters to add as metadata, and typically, these are used to add the date and the scene number. As the metadata is sent along with the timecode signal, it means that the master device will automatically send the metadata to the slave devices. To add metadata to the timecode of a :wave, you need to use the Set U/B feature, which stands for Set User Bits. If your :wave is running in EXT-RF Slave mode, continue from step 2. If your :wave is free running or running in a master mode, ignore steps 2-8 and continue from step 9. Turn the control knob to select the Local or EXT U/B option. Use EXT Source U/B - your :wave will receive its user bits settings from an external source. These will be applied to the :wave automatically. If you select this option, you do not need to define the User Bits settings. Use Locally Set U/B- your :wave will use its own user bits settings and will ignore any user bits data that it receives in timecode from the master. If you choose this option, you will need to set the User Bits on your :wave. Turn the control knob to scroll to the Set U/B option. Turn the control knob to select the combination of letters and numbers you want for the first pair of characters in the user bits metadata. Using the same technique as you used for the first two characters, select and confirm the letter/numbers for the remaining pairs of characters. Note: This section only applies if you are using your :wave is running in Int-Gen TX mode (see Set the Timecode Mode and is being used to provide timecode to video cameras. If your :wave is running in Ext-TC TX or Ext TC/C TX mode, it will receive the FPS value from the external timecode source (camera) and if it is running as an RF Slave, it will receive the FPS value from the master in the BLINK network. When running in Int-Gen TX mode, your :wave provides the timecode and frames-per-second (FPS) settings that are used by the :wave and sent to the slaves in the BLINK network. The FPS value needs to match the FPS of the video cameras being used on the shoot, so that the timecode can be applied accurately to each frame that is recorded. If your sound mixer/recorder has a word clock input, you can set your :wave to provide a word clock signal as well as timecode data. Your sound mixer/recorder will use the word clock signal to time its audio recordings so that they are synchronised with the timecode &apos;stamp&apos;. 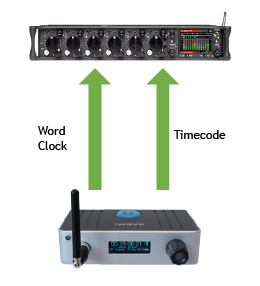 Using timecode data and a word clock signal provides greater accuracy than using just timecode. Note: Word clock is not supported by all sound mixers/recorders. If your sound mixer/recorder does not have a word clock input, it will only use the timecode data from your :wave. Set to the appropriate word clock signal for your sound mixer/recorder. The manufacturer&apos;s instructions for the sound mixer/recorder should include information on the type of word clock signal that is required. Set BNC O/P Level Your sound mixer/recorder&apos;s instructions may specify a required signal level. If so, set the BNC O/P Level to Normal or High as appropriate. If the instructions do not specify a level, set the BNC O/P Level to Normal. Set up the sound mixer to receive word clock data from an external source. Please refer to the manufacturer&apos;s instructions for your sound mixer/recorder for more information. Your :wave will now output a word clock signal to your sound mixer/recorder via the TC/SYNC BNC port. If the sound mixer/recorder does not receive a word clock signal, check that the BNC cable is connected correctly. If there is still no word clock signal, change the Set BNC O/P Level to High in the :wave&apos;s settings. If that doesn&apos;t resolve the problem, contact Timecode Systems for assistance. Your :wave is designed to send timecode data to other devices, such as your sound mixer/recorder or other Timecode Systems products. By using the same timecode, the devices can all have synchronised time and user bits (metadata). via the TC/SYNC port with a TCB-10 (BNC to BNC) cable. This method requires the Sync Output mode to be set to LTC, and as the port is being used for timecode, it cannot be used for sending a word clock signal. Use a TCB-20 (5-pin to 5-pin LEMO cable) to connect your sound mixer to the TC port on your :wave. Set your sound mixer to receive external timecode. Refer to the manufacturer&apos;s instructions for more information. If your :wave is a slave in a BLINK network, it will receive timecode settings from the master in the network and send them to the sound mixer. If your :wave is a master in a BLINK network, it will send timecode settings to the sound mixer/recorder. The timecode settings are either set manually for the :wave in the TC Generator menu, or come from an external source, depending on which master mode the :wave is using. Set T/C - set the timecode that will be sent to the sound mixer/recorder. Set U/B - set the user bits (metadata) that will be included in the timecode data that is &apos;stamped&apos; on the sound mixer/recorder&apos;s recording. If you don&apos;t have a TCB-20 5-pin to 5-pin LEMO cable, you can set your :wave to output timecode via the TC/SYNC port. But where possible, we recommend that you use the TC LEMO port for timecode output instead. Use a TCB-13 BNC to LEMO 5 cable to connect your sound mixer/recorder to the TC/SYNC output port on your :wave. Set your sound mixer/recorder to receive external timecode via its TC 5 pin LEMO input. Refer to the manufacturer&apos;s instructions for more information. Access the Sync Generator menu and set the Set BNC O/P Mode to LTC. This sets your :wave to output timecode via the TC/SYNC port. The sound mixer/recorder should now receive timecode from the :wave. If the sound mixer/recorder does not receive timecode from the :wave, it may need a High output signal. To set this, access the Sync Generator menu, select the Set BNC O/P Level option, and change it from Normal to High. (If the BNC output was already set to High, change it to Normal). Remember to repeat this synchronisation process every day - if the :wave is not resynchronised, the sound mixer&apos;s audio recording will start to go out of sync. This is because the sound mixer will use its internal clock to set the start time of its audio recordings. As the sound mixer&apos;s internal clock is unlikely to be as accurate as the :wave&apos;s clock, it may suffer from drift, resulting in the timecode and recording being out of sync.